I took a break. Just a couple months off to re-charge the batteries, learn some new things I have put off for too long, and spend time with the family. 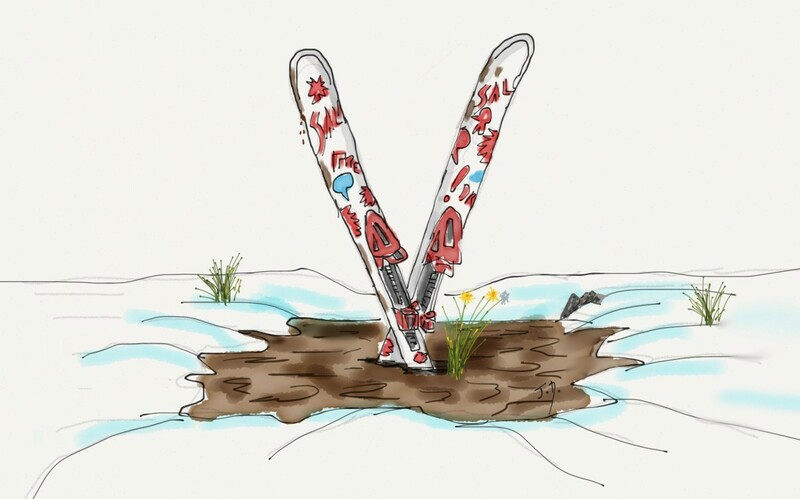 When I first began to plan my time off from work, I code-named it my “ski-battical.” I took the winter months off because my goal was to spend as much time as I could skiing around Washington and Canada. I couldn’t have picked a worse year. The “Pineapple Express” left us skiers with hills of mud. The snowpack is at record lows, with the Central Cascades near my home at 10 percent of normal. The one day I attempted to use my season pass at the Summit I found myself trapped on a blue run with a giant crater of dirt in the middle. Ski-battical turned into sNOw-battical, as in no snow. The lack of snow was depressing at first, and had me wondering if I’d made a massive scheduling mistake. It’s not often you get a gift like this, and I didn’t want to waste it. But, as I eased into my break, I found other activities and it turned out to be exactly what I needed – time for relaxation, creativity, learning, coding, sharing – and yes, even a bit of skiing right before I was called back to the office. It helped that I kicked things off with a fantastic two-week trip to Kauai with my family. We enjoyed the sunshine, stand-up paddle boarding (SUP), zip-lining, downhill biking and training for a 5K with my daughters. I spent the mornings on the beach with a cup of Hawaiian coffee and a few happy sea turtles. When I got home, I found plenty of other things to fill my time, including music. I made it a goal to update all of my guitar equipment. I have a lot of great gear, including some wonderful Full Tone and Line 6 pedals, but they had been sitting around too much lately with no electricity flowing through them. It was a complicated mess that didn’t feel ‘inviting’ anymore. To solve this, I bought an iPad Mini so I could record and play guitar anywhere and everywhere – and my guitar-loving oldest daughter joined me. We found simplicity in a single device with a plug for my guitar. I learned to play John Mayer’s version of “Bold as Love” all the way through including the full solo. My daughter learned Mayer’s 3x5s and is now onto Hendrix. We learned new tools for recording and sequencing. I also started using the Mini for sketching and drawing. I love the “Paper” app by FiftyThree and also recently bought the Pencil to go with it – more on that in a later post. The biggest Sabbatical time filler for me involved a major house project and some extensive wood working. I decided to square off my old 1980s 45-degree-angled ugly doorways and build them up to a wonderful dark-wood craftsman style. Weeks of slow sanding, cutting, staining and varnishing (repeat x3) added more dimension to our hallways and updated the house a lot. A constant joy throughout my time off was the ability to sit in coffee shops. I spent hours reading and learning things that I don’t have the time or focus for during a usual work week. I relished this time. Focusing and letting my mind wander on multiple topics (that aren’t related to work) was complete freedom! I loved being able to pick a subject and spend a few hours learning everything I could on it. I found my concentration level, my ability to focus and learn new things improved each day. This surprised me. What was different and why was I able to concentrate more? The answer was pretty obvious. The time-slicing, multi-tasking, full-on distraction of the work world was not nagging at me. I wasn’t looking at an email inbox that fills up at the rate of 40-60 extremely urgent and complex emails per hour. I was not worried about deadlines or customer issues. It was my time to learn. One of my favorite new technologies that I spent a lot of time learning was Google’s AngularJS framework. Imagine my surprise last week when I found out that it will actually be useful for me at work. after Microsoft announced they are working closely with Google to support TypeScript with AngularJS 2.0. Skiing at last! The week before I went back to work the family and I found some decent snow in the “Great White North” at Sun Peaks Resort outside Kamloops, British Columbia. It’s one of our favorite places to visit and ski. We skied four days straight, enjoying two challenging mountains, time with friends, plenty of coffee breaks, and bluebird days. Now that I’m back, I’m looking for ways to recall the “Sabbatical” feeling and use it to make my work and home life even better. I’m seeking more time to concentrate and focus, rather than trying to cram even more meetings and more “shiny objects” (what my team calls distracting new customer asks that eventually end up in the wastebasket) into a week. I’m blocking out time to head to the coffee shop and actually get more work done than I would sitting in a distracting open environment. I’m setting aside time to play my guitar, draw something, and learn new technology that doesn’t always fit into my day-to-day work. Now that I’m back and focused, I’m attempting to blog again as well. I’m going to post what I can as often as I can. I’ve updated my site, moved it to Azure, bought a copy of the X-Theme and plan to keep this thing looking good. I’m not looking for perfection, and I don’t really care how wonderful each post reads (although I have an editor spouse who straightens things up for me when she can). It’s the information sharing that I’m after. I want to start sharing the experience and knowledge I’ve gained over 20 years at Microsoft. I posted a few things on the Azure blog throughout the fall. The marketing team wants us to post there exclusively and not duplicate things on our own sites, but sadly that leaves this site neglected. I’ll “officially” post there, but I also don’t want to neglect this site. I want to share my own ideas more often.